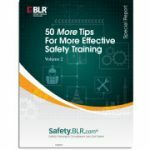 In Volume 2 of 50 More Tips for More-Effective Safety Training, you’ll receive 75 pages of useful, easy to digest, safety training information. 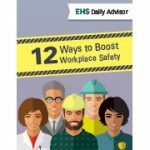 You’ll receive valuable safety training tips on chemical hazards, pesticides and poison, electrical safety, forklift, ladder and scaffold safety, in addition to many other categories. Additionally this comprehensive report provides training information on adult learners, audio conferences, diversity, follow-up training, self-paced training, and Web-based training. In this report, we have provided individual charts for the top 10 OSHA violations for both general industry and construction, with last year’s ranking in the last column. 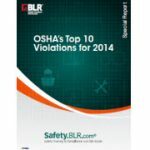 The report also reviews the different types of OSHA violations, high profile cases, and enforcement trends. 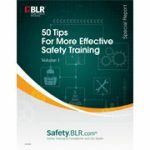 This Safety Report is a time- and work-saving reference packed with effective training information. Topics covered include: Back Safety, Bloodborne Pathogens, Forklifts, Hazardous Waste, Lockout/Tagout, Sexual Harrassment Safety, Violence in the Workplace, plus much more. Managing safety training, enforcing safety rules, and monitoring employee performance is a big responsibility. Follow the 12 suggestions in this special report and learn how to provide the guidance and leadership your employees need. This safety report will help EHS professionals enhance the value of their programs and performance in the eyes of executive management. 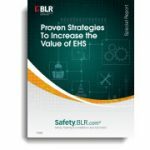 In addition, it identifies and links key EHS functions and associated business values, outlines existing methods for enhancing the business value of EHS, and offers practical tools and techniques for selling EHS initiatives to management. 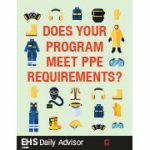 Does Your Program Meet PPE Requirements? Making sure your employees use required PPE is a tough responsibility that you can’t dodge. This exclusive safety report will make it lighter by providing you with four essential steps. OSHA estimates that 1 million forklifts are used in workplaces across the United States. Each year, nearly 100 workers are killed and another 20,000 are seriously injured in forklift-related incidents. 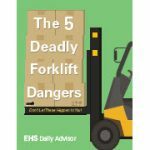 Make sure the 5 deadly dangers of forklift operations are a featured part of your training for operators and all other workers. This safety special report presents an overview of OSHA’s inspection selection process. 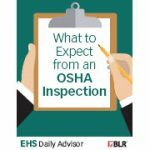 It reminds you that an inspection by OSHA may not happen for several years or it may be just hours away and that you need to be prepared for an inspection at any time. You can’t afford not to be!